Sikorsky developed the X2 technology demonstrator to prove that it is possible for a helicopter to cruise at a speed of 250 knots. The company started the program in 2005, and on 15 September 2010 demonstrated that the X2 could reach a top speed of 250 knots (290mph) in level flight, which was an unofficial record broken by Eurocopter (253mph) with its X3 in 2013. Sikorsky's X2 prototype is based on a coaxial design, and its requirements are very much inspired by the specifications formulated in the US Air Force JMR technology demonstration program. As such, the raison d'être of the X2 is quite similar to that of Eurocopter’s X3 design. Furthermore, the key concept of slowing down the rotor speed at high velocities to reduce excessive drag on the advancing blades is a common design element. Yet, that is where the similarities end. Sikorsky uses a coaxial rotor system and a pusher propeller at the very end of the tail. At high forward airspeeds, the advancing blades take the entire load, which paves the way to offloading the retreating blades. This solves the retreating blade stall problem faced by conventional helicopters. At high speeds, the forward thrust is almost solely generated by the pusher propeller. This concept is not new and, as a matter of fact, had already been used in the S-69/XH-59A design way back in the 1970s. However, that machine suffered from strong vibrations, which is an issue that has been solved in the X2 by using stiff composite rotor blades (using know-how acquired during the development of the RAH-66 Comanche) and adding active anti-vibration technology (a UH-60 Blackhawk technology spin-off). 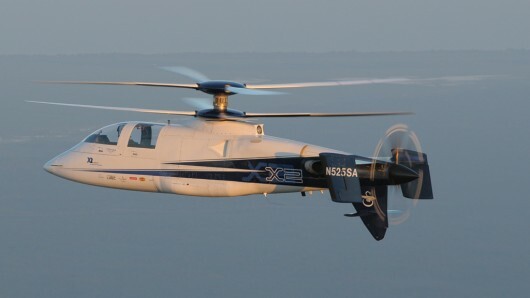 Sikorsky has two X2 technology derived models in development (2014). The first is the S-97 Raider, a prototype of which was revealed in October 2014. This aircraft's mission profile is optimized for surveillance and attack roles. The second initiative is the SB-1 Defiant, which has been developed in a cooperation deal with Boeing. The model can be characterized as the bigger brother of the S-97 Raider. Sikorsky and Boeing submitted the SB-1 Defiant to the US Army’s Future Vertical Lift (FVL) program for consideration, with the proposal being accepted in October 2014. This puts Sikorsky and Boeing in a strong position with respect to the US Army’s helicopter replacement program, which involves replacing literally thousands of helicopters in a time-frame somewhere between 2025 and 2050. Do you want to comment the Sikorsky X2 helicopter?